While trying to be its own thing, Slither gives a big nod to underrated horror films that are overshadowed by the slasher killer and his sequels. James Gunn successfully pays homage to films like Basket Case, Empire of the Ants, Frogs, Night of the Creeps, The Toxic Avenger, and many other Troma films. There’s even one scene where it shows the name of the school is “Earl Bassett Community School.” If you don’t know Tremors, then you just won’t get it. 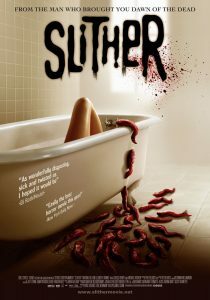 Despite being unique and marketable, Slither failed at the box office. When asked about the failure, producer Paul Brooks claimed “[…]Because it was comedy-horror instead of pure horror is where the problem lay. It’s the first comedy-horror in a long time, and maybe the marketplace just isn’t ready for comedy-horror yet. It’s difficult to think of other explanations.” I don’t think it’s necessarily that as much as it is the subject matter. Many mainstream movie-goers do not know what Troma is, so likely, the concept of Slither and the resurrection of creature-features didn’t quite register with them. The plot: A meteor that has a number of alien-like worms crashes into the town of Woodsville one day and a car-dealer named Grant (Rooker) is the first to be infected. He becomes very sickly, and his wife, a teacher named Starla (Banks), questions his health when he begins missing out on his doctor appointments. She then discovers what is going on with Grant, and realizes that he has now been taken over by a mutant-slug monster. I, myself, wasn’t concerned with the plot as much I was concerned with the creatures. Sure, I like a little backstory, but here, none of the characters truly matter because usually the creatures are thrown in the foreground. I can accept that. The creatures are about forearm length long, they wiggle, they’re slimy, and they force themselves into your mouth so they can take over your body and form one of the most disgusting monsters in recent film. The visuals are actually quite realistic. Whatever a mutant, meat-eating slug is supposed to look like, they sure nailed it. So what’s the problem? It’s hard to say. For one, this is the first time, I’d say, Elizabeth Banks has been bad in a film. Her character is a mannequin most of the time, and the film uses her for good scream scenes and the stereotypical damsel in distress. Her purpose in the film is to be scared by monsters, and ogled at by her students. Another problem is this is one of those creature films where the pacing isn’t put into great effectiveness. But I think Slither makes up for it by having some great shots of the worms, and some great scenes that you can’t help but wiggle at. James Gunn clearly wanted to give a serious tribute film to all those horror films that have been left in the dust. I can respect that, and the turnout is a lot like all those films I listed before – simple, yet mostly entertaining. Slither is just a hair away from a recommendation mainly because there isn’t a whole lot going on for a lot of the film besides characters walking around and doing their own thing. The final minutes with the slug monster are wholly entertaining and very crafty. This is truly a “patience is a virtue” type film.